MISSION, KS--(Marketwire - January 31, 2011) - (Family Features) For a great game-day party, give rivaling fans one thing they can agree on -- the food. 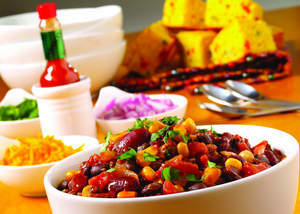 Ditch traditional finger foods for a hearty, winter classic with a spicy Southwestern twist. A hearty mix of ground beef and beans, with hints of chili powder, cilantro and barrel-aged Tabasco sauce, Game-Day Chili is sure to become a household tradition. Serve the chili with an array of toppings on the side -- like Cheddar cheese, red onion and original Tabasco sauce -- allowing guests to customize their own bowl. For more fan-pleasing recipes visit www.Tabasco.com. Heat vegetable oil in medium saucepan over medium heat. Add onion; cook until tender, about 5 minutes, stirring occasionally. In drippings remaining in saucepan, cook ground beef over medium-high heat until well browned on both sides, stirring frequently. Stir in chili powder and salt; cook one minute. Add tomatoes (and their liquid), kidney beans and Tabasco sauce. Heat mixture to boiling over high heat. Reduce heat to low; cover and simmer 15 minutes, stirring occasionally. Stir in corn and cilantro; heat through. Garnish with shredded Cheddar cheese, red onion and cilantro sprigs, if desired.